Once the urban farm spaces have been selected, grass removed and soil prepared, it is ready for planting. For the first year of planting, it is best to prepare the soil the year before, to give the farmland time to turn compost and mulch into nutrient-rich soil. It is recommended to plant seeds in flats rather than straight into the farm soil for several reasons. One is that by planting in flats, they can be stored in small seedling greenhouses to help protect them from cold, wind and frost in early spring when it would be too cold for seeds out in the elements. This extends the growing season. Another reason is that the soil can by used for other purposes while seedlings grow elsewhere, for example it can be producing green manure (see 1:3), and be prepared through tilling and aerating. Also, weaker seeds will not waste space on the land and can be excluded during the transplanting process. Begin by building flats for the seedlings. The standard flat size is 3 inches deep by 14 inches wide by 23 inches long (internal dimensions). Flat length and width are not critical, but depth needs to be 3 inches as a shallower soil will result in stunted plants. Completely filling the flat, add special soil mixture that is ideal for seedling growth. There are 2 mixtures you can use: 1) Combine (by volume) one part soil from the earth where the plants will be transplanted to (farmland; use soil saved from the first trench dug when aerating), with one part sifted compost. 2) Combine (by weight) one part each moist, sifted compost, gritty sand, and turf loam (for how to make turf loam, see 1:2:i). If available, line the bottom of the flat with decayed oak leaves for drainage and extra nutrients. 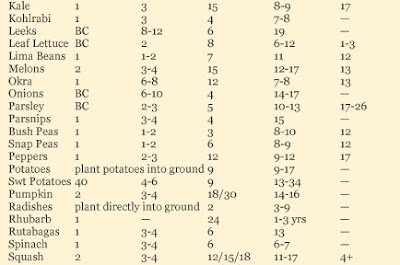 Plant seeds 1” to 2” apart, depending on the plant (see Master Charts at the end of this section), and as deep as the thin vertical dimension of each side. Cover the seeds with a layer of soil. Now that the seeds are sown, place the flats in miniature greenhouses for germination and growth (up to 12 weeks depending on plant). Transfer to a cold frame for 2 days when seedlings are almost ready for transplanting, then out into the open air for 2 more days to complete the hardening off process before transplanting. To deter mice and birds, a cover can be built for the flats using scavenged or reclaimed materials: construct a frame of the same size as the flat, and top with wire mesh; place this on top of the flat outdoors. 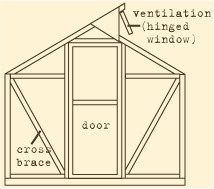 A mini-greenhouse made from plastic sheeting, glass and wood can increase the temperature of the soil and the air surrounding plants. Double-glazing, which is a double layer of plastic sheeting or glass with an airtight gap between them, will protect the plants in sub-zero weather. Cold frames provide slightly less solar heating than a greenhouse and helps harden seedlings before being transplanted into the colder farmland outdoors. Mini-greenhouses are suitable for home gardens or individually-attended plots. For community-scale farming, full-sized greenhouses will serve a larger number of seedling flats. 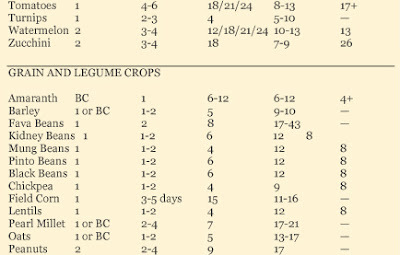 Most seedlings are ready to be transplanted when they are 2” to 3” (see Master Chart at the end of this section). Handle seedlings as little and gently as possible. Early evening is the best time to transplant so the seedlings settle into the new soil during more moderate weather conditions. 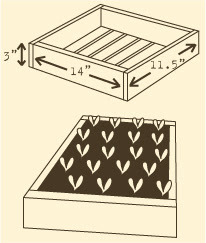 Using a fork, gently separate a 4” x 4” section of soil containing seedlings. Place this section on the ground and carefully pull away one plant at a time for transplanting. Keep as much soil around the roots as possible. If the roots are tightly packed, gently spread the roots out in all directions. 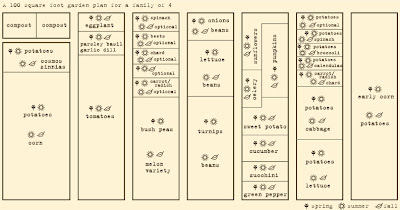 Following the Biointensive Farming method below for layout and schedule, place each seedling into a large enough hole to cover the plant/roots with soil up to and including the first set of true leaves. Water gently and thoroughly, then press the soil firmly around the seedling. It is advised to save extra seedlings in flats instead of transplanting all available seedlings at once. This is because inevitably some transplanted seedlings will die off or be eaten by animals or insects, leaving spots in the soil pattern of seedlings. 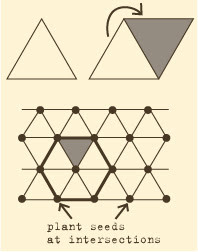 These spots will need to be filled in order to preserve the miniclimate created by closely planted seedlings, as per the biointensive method outlined below. Biointensive farming is a whole, interrelated system where all the components must be used together for optimum effect. This system uses less water than conventional farming methods, less fertilizer, does not require machinery, increases soil fertility, encourages biodiversity, and uses 100% space efficiency. FALL: begin additional compost piles with leaves and garden waste; harvest summer crops; plant fall/winter compost crops. Most growing beds are 100 square feet (5 by 20 feet). Crops planted in the spring make way for late summer crops when spring crops are harvested. Some crops stay all season. Companion planting is the constructive use of plant relationships, building on each plant’s complementary physical demands. Placing complementary plants together creates a microcosm that includes vegetables, fruits, trees, bushes, wheat, flowers, weeds, birds, soil, microorganisms, water, nutrients, insects, toads, spiders and chickens, to grow together and help repel pests. For large-scale planting, as seen in the plan above, the plants complement each other over a larger area, sharing the beds with several crops, and rotating within the season. Certain herbs and crops will deter insect pests. Below is a list of pets and the plants that control them. Encourage natural insect control by enlisting the aid of nature. Birds feed on spiders, caterpillars and worms. You can encourage the presence of birds with running water, planting bushes for their protection, planting sour berry bushes for food, and by growing plants that have seeds they like to eat. Toads, snakes and spiders eat cutworms, slugs, crickets, ants, caterpillars and squash bugs. Ladybugs feast on aphids alone. Praying mantids should only be used in infestation emergencies as their diet is not selective. Trichogramma wasps lay their eggs in pests’ larvae, which eventually kill the pests. Tachinid flies are parasites that help control caterpillars, Japanese beetles, earwigs, moths, tomato worms, and grasshoppers. Syrphid flies prey upon aphids and help pollinate crops. Labour-intensive though it may be, you can pick the pest insects from the plants manually – providing it is certain the insect is harmful and the source of the problem. Spraying is another effective method: create a tea from strong substances like garlic, onion and hot peppers to spray on plants and discourage chewing insects from eating the stems, leaves and fruits. Mild soap solutions (not detergents) asphyxiate tender bugs when sprayed. Grains are a necessary crop to grow for human consumption of wheat, oats, barley, rye and buckwheat, while hay is a major supplement to farm animals over colder months. Generally grains are easy to grow provided the soil has been prepared adequately before planting. On average, a 20 foot by 55 foot plot of land will supply wheat for 4 people for one year. WINTER CROPS: winter wheat, barley, and other hardy crops can be sown in early fall, allowed to grow a little, then go dormant over the winter; in the spring, the crops shoot up and are ready for harvest in mid-summer. 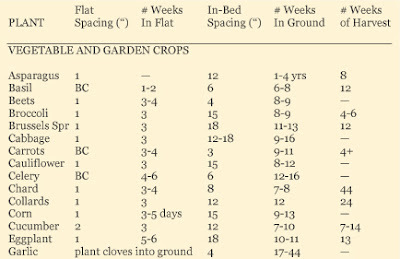 SPRING CROPS: hardy or delicate crops, including spring wheat, can all be sown at the end of the last frost in early spring and are ready for harvest in early fall. Soil should ideally be prepared as outlined in section 1:3, and at the very least should be well-tilled and fortified with green manure or compost. To sow seeds, use a broadcasting method of scattering the seeds by hand. To ensure even coverage, scatter at a 45 degree angle while walking up one side of the plot, then return down scattering at the opposite angle over the first scattering. After sowing, till or rake the soil to work the seeds in. Rotate the location of your grain plots from year to year to avoid soil depletion, varying the type of grain grown in the prepared land. A typical rotation plan, year to year, might be corn the first year, followed by alfalfa, then winter wheat, then vegetables, then soybeans, then hay pasture, etc. WHEAT: Requires a cool, moist growing season and two months of hot, dry weather for ripening. 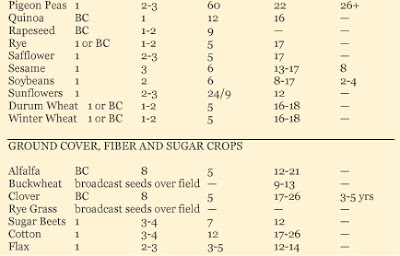 Winter wheat is sown in late-September, and spring wheat along with other crops. OATS: A hardy crop that produces high-protein grain. Thrives in a cool, moist climate and cannot tolerate drought. Sown as a spring crop and harvested into shocks and left to dry on the field. RYE: Can be used for green manure and as a cover crop, as well as a grain for making bread and feeding farm animals. Sown in the fall, this crop does well in poorer soil and tolerates cold, drought and dampness. BUCKWHEAT: This crop prefers moist, acid soil and hot weather. Matures rapidly (60 to 90 days) and can be sown in the same plot as winter wheat once the wheat is harvested. BARLEY: Requires a long, cool ripening season and moderate moisture. Plant in early spring. Excellent dietary staple for humans and farm animals. CORN: Many varieties of corn exist, though generally corn for eating fresh is of the sweet variety while “field corn” used for making flour is not sweet. Ready for harvest after the plants are dead and dry. Ears of corn should be husked and stored away from rain and mold immediately. After the grain has been cut, gather the stalks into sheaves and stack them to dry in the field, in groups of 3 sheaves leaning against each other vertically, until no trace of green is left. To thresh the grain (remove grains from stalks), lay the sheaves on a sheet over a hard surface and hit the seed heads with a stick to knock the seeds loose. To separate the grain from the chaff (outer husk), toss the grains up in the sheet on a breezy day, or pour grain and chaff back and forth from one container to another on a breezy day, as the wind will blow the chaff away but let the grain fall. Store grain in a covered metal container, or wooden bin that as been rat proofed with wire mesh (scavenged or reclaimed). Stored grain must be kept thoroughly dry to prevent mold. Hemp is a cannabis plant from the same family as marijuana, and as such there were once laws in place that forbade the production of both plants. Now, the many benefits of producing hemp have been recognized by the authorities and it is now encouraged to produce due to its many values. As well, the myth that hemp was an intoxicant has been debunked, the THC levels in industrial hemp are so low that no one could get high from smoking it. Moreover, hemp contains a relatively high percentage of another cannabinoid, CBD, that actually blocks a marijuana high. Therefore hemp has come to be known as "antimarijuana." Hemp is one of the most versatile plants know to humankind. Its fibers can be used for textiles, rope and paper. Its seeds are an extremely healthful food in whole form or as a naturally omega-rich unsaturated oil, which can also be used as fuel in oil-burning lamps or stoves. One hectare of seed hemp produces 1000 to 1500 liters of hemp oil plus several thousand kilos of fiber. Hemp plants are easy to grow and can generally follow the same guides as used for the sesame plant. NOTE: It is strongly advised to refrain from cultivating marijuana plants as these are still outlawed. The discovery of any marijuana grow operations can result in a seisure of property and land which would have detrimental effects if it is also land being used for vital food production. Is the diagram of the garden 100sf in total, or is each rectangle 100sf? Is it intended to fully feed 4 people? over 50 percent of the population will have to farm. After visiting Cuba I would say most elderly and out of shape will die or become hardened from manual labor. In 1981 while driving through Albania, some people were pulling plows in the field with people. Composting will be essential without commercial fertilizer. Government farm and work camps that are populated by the poor and prisoners will be dispersed over the country. Government Vehicles and special heavy transport will possibly be run with tar sand fuel. Many vehicles will be stripped and made into wagons used to transport food, water, people and other goods. Food will be dried and packaged before transport. Hemp will be processed on site manually. weaving and clothing would be processed in the main city. Most hospitals have very large generators powered by diesel engines that can be run on wood gas if properly converted. Many hospital procedures would be eliminated from supply depletion. CT's MRI's, etc. Air Transport will be minimal but active.